The Midwest region of the United States consists of the states in the center of the country, east of the Rocky Mountains. 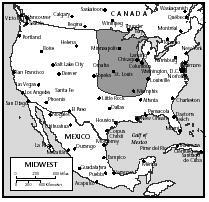 States considered part of the Midwest are North and South Dakota, Nebraska, Kansas, Minnesota, Wisconsin, Iowa, Missouri, and Illinois. The combined population of these states is over 28 million. (Sometimes the states just east of these—Indiana, Ohio, and Michigan, are also included when describing the Midwest.) The area is known for its plains, which are long stretches of grasslands. 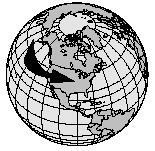 Historically, many tornados have touched down in the region, due to the flatness of the land and the area's climate. In Kansas, tornados are considered to be a fact of life. Dodge City, Kansas, is said to be the windiest city in the United States, with an average wind speed of 14 miles per hour. However, the Midwestern states are not solely made up of flatlands. Many states have natural and artificial lakes and streams. In fact, Minnesota has over 10,000 lakes. Midwestern climate is highly changeable, according to season and state. The winters are generally snowy and cold, averaging around 10° F . Springs are mild, with temperatures around 70° F . Summers are hot, averaging around 80° F , and fall temperatures taper down to around 40° F to 50° F .
The climate and terrain of the Midwest are perfect for cultivating crops. The Midwest is commonly called the "breadbasket of America." Kansas is known as the Wheat State, Iowa's most famous crop is corn, and Nebraska is known as the Cornhusker State. United States and made it their home. In the early 1700s, the Germans started to arrive and brought beer, sauerkraut, and sausages. They also introduced the tradition of serving meals family style—meats, relishes, soups, vegetables, and pies were set on the table all at one time. The British arrived in the late 1700s and brought pasties (PASS-tees), or meat pies, bread pudding, and roasts with potatoes. The Italians brought pastas and native cheeses, and the Hungarians brought goulash. Lefse (potato bread) and meatballs were introduced by the Scandinavians. Grease a small casserole or 8-inch square baking dish with shortening. Place the bread cubes and raisins in a mixing bowl and gently mix. Pour into baking dish. In the same mixing bowl, combine the eggs, milk, sugar, and vanilla. Stir well. Pour the mixture over the bread cubes and raisins. Bake for 35 to 45 minutes, or until a knife inserted in the middle comes out clean. Foods of the Midwest are considered to be simple and hearty. Dairy products, such as milk, cheese, and eggs, are common ingredients in Midwest cooking. Main dishes may include roasts, stews, and dishes made from trout and whitefish. Rice is used in many side dishes and desserts. Wheat bread and cornbread typically accompany meals. Seasoning with spices is generally mild, and fresh herbs such as dill, parsley, and sage may be used to flavor a dish. The Midwest is famous for its long stretches of grasslands. Corn (Iowa's most famous crop), apples, wheat, and potatoes are some examples of staple crops. Beef, pork, and poultry are produced in many Midwestern states, and trout, bass, and walleye are just a few examples of fish found in Minnesota's 10,000 lakes. Many Midwestern foods are based on the season. In summer months (around May to August), picnic foods such as deviled eggs (Indiana is a leading state in egg production), potato and pasta salads, and fresh fruits are enjoyed. Winters once forced cooks to find methods such as smoking, pickling, and canning, to preserve food. Meatloaf (made with ground beef and breadcrumbs), chicken and noodles, and chili (a thick beef and bean stew) are hearty foods to keep people warm and full during the harsh winter weather. Add chopped onions and garlic. Sauté onions and garlic until golden, about 10 minutes. Add oregano, bay leaves, and beef, and cook until beef is no longer pink. Add 2 Tablespoons of the chili powder, tomatoes, and kidney beans. Reduce heat to low and simmer, stirring occasionally, about 1 hour. Simmer for an additional 15 minutes. Serve hot. The city of Cincinnati, Ohio, located in the southern part of the state, and bordering the Ohio River, is famous for its unique chili, which may include such ingredients as allspice, cinnamon, or cloves, and sometimes even chocolate. Cincinnati-style chili is usually served as a topping over a bowl of spaghetti. A typical Midwestern meal is considered "all-American." It might be roast beef, grilled steak, hamburgers, or meat loaf accompanied by potatoes (mashed or baked), green beans, corn on the cob, and apple pie for dessert. Kansas City, Missouri, is a leading producer of beef cattle and famous for its steaks. Other Midwestern favorites are chicken potpie (a creamy stew of chicken and vegetables baked in a pastry crust), potato salad, wild rice soup, and corn relish. Corn relish is made from fresh yellow corn, vinegar, and sugar, and is flavored with red peppers, onion, and celery. It is usually served with grilled or roasted meat. 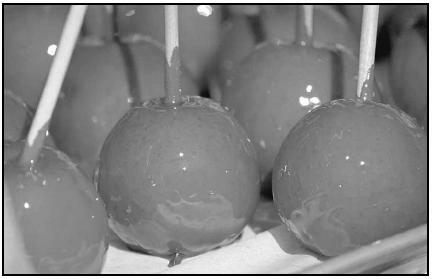 Candied apples—apples on sticks dipped into a sugary red or caramel coating—are a favorite fall treat, and are a common sight at county fairs and fall festivals across the Midwest. Fill a large saucepan about half full with water. Add eggs. Bring the water to a boil. Lower heat and simmer eggs for 15 minutes. Drain eggs. Run cold water into the pan to cool the eggs. Drain and allow eggs to cool completely. Carefully peel the eggs and cut in half, lengthwise. Remove the egg yolks and mash them together in a small mixing bowl. Stir in mayonnaise and dry mustard. Spoon yolk mixture into the halved eggs and sprinkle with the paprika. Remove the husk from the corn. Fill a large pot about half full of water. Bring to a boil and add the corn. Boil over high heat until corn is cooked, about 15 minutes. Remove from the water and rub butter or margarine over the corn. Christian religions dominate in the Midwest, with Christmas and Easter being the main holidays. These holidays are celebrated in generally the same way as the rest of the United States; it is a time for families to get together and visit and eat. Roasted ham or turkey is a common main course. A variety of vegetables may be served, such as potatoes, carrots, green beans, or corn. Depending on family traditions, gifts are exchanged Christmas Eve or Christmas day. Children may hunt for colored Easter eggs on Easter, go to church, and eat candy from baskets given to them by the Easter Bunny. There are many non-religious holidays and festivals celebrated in the Midwest. Thanksgiving Day, a national holiday, commemorates the feast held between the Pilgrims and Wampanoag Indians in 1621. Midwesterners, as most Americans, celebrate Thanksgiving with a menu that typically includes turkey and stuffing, mashed potatoes, cranberries, green bean casserole, rolls, and a variety of pies, such as pumpkin pie. Television sets are usually tuned to Thanksgiving parades in the morning and football in the afternoon. Combine all ingredients except ⅔ cup french fried onions in a casserole dish. Stir, then top with remaining ⅔ cup french fried onions. Food festivals are very popular in the Midwest. In early July, St. Paul (Minnesota's capital) celebrates the Taste of Minnesota Food Festival. Food stands feature roasted corn on the cob, deep-fried walleye, corn dogs, barbeque ribs and chicken, and a variety of soft drinks and beer. The festival lasts for one week and ends each night with fireworks. The Potato Bowl festival is celebrated in Grand Forks, North Dakota. Its main attraction is free french fries. In 1999, over 3,840 pounds of potatoes were used. Activities for children included art projects, face painting, a bean bag toss, and making handprints. An estimated 3.6 million people attended the annual week-long Taste of Chicago festival in 2001. Each year, this big event attracts nearly 70 of the area's finest restaurants, as well as well-known musical acts. It is one of Illinois' top tourist attractions. Milwaukee's Summerfest, similar to the Taste of Chicago, offers visitors a variety of the area's best cuisine and musical entertainment. Midwestern people, like many other people in the United States, usually eat three meals a day and snacks throughout. Breakfast may be hearty, with bacon, sausage, eggs, toast or biscuits, grits or oatmeal, and coffee, or a simple doughnut or cinnamon roll with coffee. Lunch is usually a light meal, with dinner being the main meal of the day. Lunch may be a sandwich (such as a reuben), a salad, or soup. A hamburger and french fries may be a quick lunch picked up at a fast food restaurant. Students may buy lunch at the school cafeteria, or carry a lunch, made at home, in a brown bag. Barbequed pork sandwiches, chicken nuggets, and hamburgers may be on a typical school cafeteria menu, while a sandwich, potato chips, and fruit may be brought from home. Snacks eaten in the Midwest are similar to the rest of the United States, and may include potato chips, crackers, carmel corn, and candy. Spray a broiler pan with the cooking spray. On 6 of the bread slices, place 3 slices of corned beef, a heaping Tablespoon of sauerkraut, and 2 slices of cheese. Place the other 6 slices in the pan to toast. Place the pan under the broiler. Wait until the cheese is melted and bread slices are lightly toasted, about 2 minutes. Spread the bread slices with the dressing and place on top of the other sandwich half. Preheat oven to 250° F .
Place the popped corn in a large roasting pan. Heat the butter-sugar (caramel) mixture over medium heat, stirring constantly. Remove saucepan from heat and allow to cool about 5 minutes. Pour caramel mixture over popcorn and stir until mixed. Remove pan from oven and pour onto wax paper. Allow to cool slightly, and break apart. Dinnertime is usually the time when family members gather to eat and talk about their day. Large dinners are traditionally cooked on Sundays. Dinner, or supper, usually consists of meat, such as beef, chicken, or pork chops, a vegetable (or vegetable casserole) such as corn, green beans, or carrots, and a starch, such as potatoes, rice, or noodles. Baked beans may also be eaten. Combine hominy and corn in a greased 2-quart casserole dish. Top with cheese. In a mixing bowl, whisk eggs, milk, flour, and garlic. Pour mixture over hominy and corn mixture. Bake 50 to 55 minutes, or until inserted knife comes out clean. Dinner is most often eaten at home, but may also be eaten at a "sit-down" restaurant, where diners are waited on, or at a fast food restaurant. The list of fast food restaurants is endless, offering a wide variety of foods. McDonald's offers its regular fare of sandwiches and fries, along with some regional dishes. In the Midwest, for example, grits are on the breakfast menu. Kansas City, Missouri, is known for its beef cattle and its streets are lined with steak restaurants. Chicago is famous for its deep-dish pizza, which was first made there in 1943. It is baked in a deep dish, so the sides of the crust hold in more cheese and toppings than a thin-crust pizza. Heat oil in a large frying pan over medium to high heat. Add pork chops and brown both sides. Season with salt and pepper. In a large bowl, combine the potatoes, carrots, onion, salt, marjoram and pepper. Mix lightly and place mixture into a 9x13-inch baking dish. Pour milk over potato mixture and top with browned pork chops. Cover baking dish with aluminum foil and bake for 1½ hours, or until pork chops and vegetables are very tender. In general, people of the Midwest receive adequate nutrition. The foods they eat come from the land and are plentiful. A variety of crops, such as corn, potatoes, and wheat are grown, and cattle and poultry are raised in abundance. These foods supply not only the Midwest, but also the rest of the United States and abroad. These natural resources contribute to the United States being among the world's leading exporters of wheat and corn. For those who cannot afford it, the United States government provides money to pay for school lunches and nutrition programs. Adams, Marcia. Heartland : The Best of the Old and the New from Midwest Kitchens. New York, NY: C.N. Potter, 1991. Andrews, Glenn. Food from the Heartland: The Cooking of America's Midwest. New York, NY: Prentice Hall Press, 1991. D'Amico, Joan. The United States Cookbook: Fabulous Foods and Fascinating Facts from all 50 States . New York, NY: John Wiley, 2000. Ginderson, Mary. Pioneer Farm Cooking . Mankato, MN. Blue Earth Books, 2000. Mandel, Abby. Celebrating the Midwestern Table: Real Food for Real Times . New York, NY: Doubleday, 1996. Cuisinenet.com. [Online] Available http://www.cuisinenet.com/glossary/midwest.html (accessed April 22, 2001). Culinary History Timeline. [Online] Available http://www.connerprairie.org/diet.html (accessed April 22, 2001).